Those familiar with my other site, bythom.com, probably are well aware of my seminal article on support. When I originally wrote those words back in 2003, small competent digital cameras didn't exist. For some monster DSLR/lens combinations, even what I suggested as adequate support could come up a bit short. I remember trying to get my 400mm f/2.8 and D2x to really shine on a Gitzo 1530 with a BH-55 and a Wimberley Sidekick. That's really pushing the envelope. It can be done, but it's not optimal. I invite you to read that other article if you haven't already (even though it's slightly out of date despite being updated twice in twelve years), then come back here. I'll wait. Scared, aren't you? 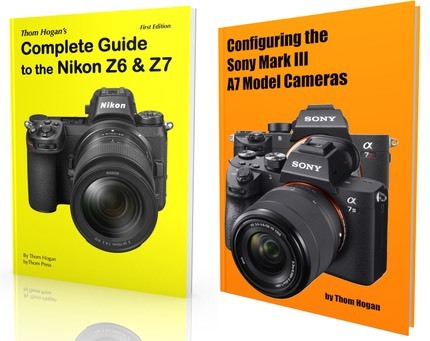 You just bought a US$599 mirrorless camera and now this guy on the Internet you don’t know is going to tell you that you need to spend maybe double that to hold the camera steady? What's wrong with image stabilization? Okay, let's deal with that question first. Image stabilization (IS) has its uses. If your subject is stationary (e.g. landscapes, cityscapes without people in them, etc. ), go right ahead and push your shutter speeds down into the teens (1/15) with stabilization on. It'll probably work out okay if you understand how the system works and there's not an 8.0 quake happening at the time. But IS isn't a be-all, solve-all solution. If there's subject motion of any kind, trying to use IS with slow shutter speeds is going to introduce edge blur on your subject. Hey, weren't you trying to avoid blur by using IS? There will come a time when you truly need very long shutter speeds (e.g. dusk, waterfalls shot with an ND filter, etc. ), or you need the camera to be completely steady yet positionable when you're dealing with fast motion, or when you need to avoid IS due to subject movement. There are more scenarios that trigger the need for a tripod, but all you need to realize is that there will come a time when you need one. These mirrorless cameras are lighter and smaller, so you can get by with a lighter and smaller tripod, right? Yes, that's true, as long as you pay attention to three key parameters. The legs need to be stiff and not conducive to "ringing." Most mirrorless cameras still have mechanical shutters, so there is movement and vibration that is triggered by actually taking a picture (Ricoh GXR with its leaf shutter lensors and the Nikon 1 with its electronic shutter are notable exceptions that produce little camera vibration while shooting; Sony mirrorless cameras as well as some others can also be set to electronic first shutter, which removes the initial shutter jolt). You don't want any of this motion to enter the joints or the legs without getting immediately damped. Cheap tripods with channel alluminum legs just don't fit the bill for this. Five section legs (lots of joints) tend to be buzzkill, too. And if there's more mass up top (camera/lens) than down below (head/legs), the problem is almost certainly going to raise its head. You still need a strong head/camera connection. Basically you want an entire support system to act like one giant piece of heavy, solid mass. Ever tried to kick a five pound metal cube? Hurts the toes and the metal doesn't move far. Ever tried to kick five pounds of metal strung out into a six foot, multi-sectioned pole? You end up with a very bent pole, if not a broken one. I use Arca Swiss plates on a camera for that reason: they form a continuous mass between camera and head. Great, one joint removed. The head needs to be good and probably have some Loctite (not the permanent stuff, just the stiffener) applied between it and the mounting plate on the top of the legs. Mounting to a centerpost is a no-no unless its a damned good centerpost that can be convinced to fully join its mass to top plate of the legs. Finally, the leg extensions all need to be tight and not prone to vibrations themselves. As noted in my other article, you generally need more mass below than above. So that two pound tripod you found isn't going to really steady your two-and-a-half pound camera body plus lens plus plates, especially on a windy day. Indeed, this is one place where those bottom-of-the-line carbon fiber pods excel: they're still usually heavier than most mirrorless cameras with lenses, though. My RRS Versa 2 legs plus a decent head mass weigh more than my Nikon 1. Heck, even my heaviest mirrorless camera with the heaviest lens I've got doesn't really outweigh that support, and it's really good support to start with. So don't get too carried away with going too light down under, but yes, you can downsize from what you use for your DSLR with a 300mm or longer lens. If you don't mind staying low to the ground, let me give you the lightest set I'd use with most of my mirrorless equipment: a Benro C-069MB set of legs with their B-0 head [update: I currently use the MeFOTO GlobeTrotter carbon fiber version, which is a variation on the same thing]. This is a small, light set that I've found works well with a couple of caveats: (1) it's got a centerpost. Strongly consider removing it and finding a way to direct mount the head to top plate (hint: hardware store, long 1/4" bolt and washer); and (2) never use the bottommost set of leg extensions, plus try to avoid using the second bottommost. That gives you 26" max of leg extension. Good thing that there are more great photos located closer to the ground than at eye level, isn't it? The RRS Versa 1 looks like it will be perfect for these mirrorless cameras, but it's only a little more than a half pound lighter than the Versa 2, which is what I'm carrying most of the time for my mirrorless cameras. Gitzo and others have some good offerings in the range between the Benro and the RRS, too, so you've got a range of prices to look at. That said, I've found other ways to deal with supporting my mirrorless cameras that are more faithful to the "go small and light" idea they promote. For example, get a really good metal legged (no extensions, just one set of short legs) table pod. These things will put you about 6" off the ground (where's the articulating LCD when we need it? ), but that's actually rarely how I use them. I'll hold the pod with one hand against a wall, a large post, on a table or chair, anyplace I can get traction and put pressure against to keep it steady. That's usually more than enough support for a 1/2 second exposure, maybe even longer. Then there's the Opteka X-Grip and the even smaller Handlepod. They work great on flat surfaces, and again, that flat surface doesn't have to be horizontal. I hold my Handlepod with a mirrorless camera on it against walls and rocks all the time to get long exposures. The nice thing about it is that it is very small and light, twists into a huge number of positions, and collapses to fit in my other jacket pocket when I'm out and about. I wish its lock-down clamps were a little easier to use and tighten, but that's a small price to pay considering you paid a small price. I should also mention monopods (and hiking poles with monopod conversions on top). A monopod will take vertical motion completely out of the equation, leaving you with only the horizontal motion to control. If you know how to use a monopod, that's easy enough (hint: think tripod. If the monopod is one leg, what thing do you have with you that has two legs?). That's enough to get you started. Eventually I'll circle back and give you some more suggestions on how to keep your mirrorless camera steady. At least you don't have to worry about mirror slap ;~).